Australia is still floating lower on the list, but I'm thinking South Korea may well be a candidate for Cyber Privateer World Headquarters as the first nation to issue Letters of Marque and Reprisal. 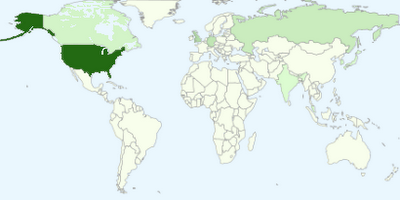 And as for my Russian readers, Richard Clark (Cyber War ) seems to think you're ahead of China in the super virus race. Based on my back tracing of hijacked or fraudulent spam email I'm getting that peddle cut-rate prescription drugs or other super "deals" on sites that try to drop viruses into my system, I'm landing pretty exclusively in domains run by you guys. Maybe you truly are ahead of the Chinese. You certainly seem to be spending an inordinate amount of time on my "22 Principles for Creating The Perfect Virus" blogs. So, uh, why don't you try to see how smart the Chinese hackers really are by doing a little reconnaissance on my published list of Chinese attack servers? Or not. Your call, Comrades. Na Zdrowie!